On one of our sessions a guy I used to coach told me that basically what I help people with is to live more in the flow in life. As I reflected on that for a moment, I had to agree with him. We have all experienced those moments in our lives when we were immersed in an activity, time flew by or slowed down (however it felt like), things felt effortless, we could come up with the right decisions or right words to say. Whether it be about being in the flow in a conversation with a person where we are deeply connected, fully present, and listening. Or in doing an activity, like playing a sport, or poker, where you feel you can effortlessly perform at your best, and you feel more in touch with your intuition. These moments are glimpses into what is really possible for us when we are at our full potential in the moment. This flow is our natural, default state. Or if I want to be more accurate, I’d say from our default state it’s very easy to get immersed in an activity and be there fully, and experience it as “flow” or “in the zone”. I once had a conversation about flow with a client of mine who plays mid-high stakes Cash game poker. It looked to me that it is on a horizontal level, where towards the left side there are feelings of frustration, anger, uncertainty, fear, and on the right side there is flow. And at any moment we are on one part of this spectrum. However now it looks more like a vertical scale. At the first level there is a scale going from fear/frustration/anger/sadness/misery towards joy/excitement/love/gratitude. Basically the full spectrum of human experience. Underneath this level there is Joy or Flow or Innate well-being or Presence or Clarity (however we refer to it). This level is always there, always under the surface at any moment. And we are just not aware of it many times. When we are up in our own personal thinking we can experience the full spectrum of human feelings. And when we drop out of our own personal thinking, and have a clearer state of mind, then we return to our innate well-being / flow / presence. This is what we experience in those moments of flow, when we are totally immersed in the activity. Our feelings of frustration, anger, insecurity are there to show us what kind of thinking we are entertaining in the moment in our head. That’s the kindness of the design. We have this amazing emotional guidance system within us, to help us awaken to the fact that we are lost in thinking that is not in alignment with our innate well-being. “Jeanne Nakamura and Csíkszentmihályi identify the following six factors as encompassing an experience of flow. Actually all of these are characteristics of moments when we have a clear state of mind. Our natural state. Combine this description and list with what I’m pointing to. Our only problem that gets us out of this default state, is when we get caught up in our own personal thinking. By personal thinking I mean that chatter in our head evaluating us, our performance, either judging, having expectations, comparisons, and so on. Most of this chatter goes on without our conscious awareness of it. When you are in flow, you don’t get caught up in these thoughts, your full awareness is on the action, and not on the “little me”, our personal mind. Where most of psychology and sport psychology gets it wrong is that it tries to define the characteristics of flow or being in the zone (like the list above), and then by modelling trying to recreate the experience with our mind. But here is the paradox. It tries to use the small/personal mind to get into the experience of mindless state, where we are operating from the Big Mind, which is the intelligence behind life, our true essence, our innate wisdom, where we can also access our intellect as it works for us, not against us in that state. 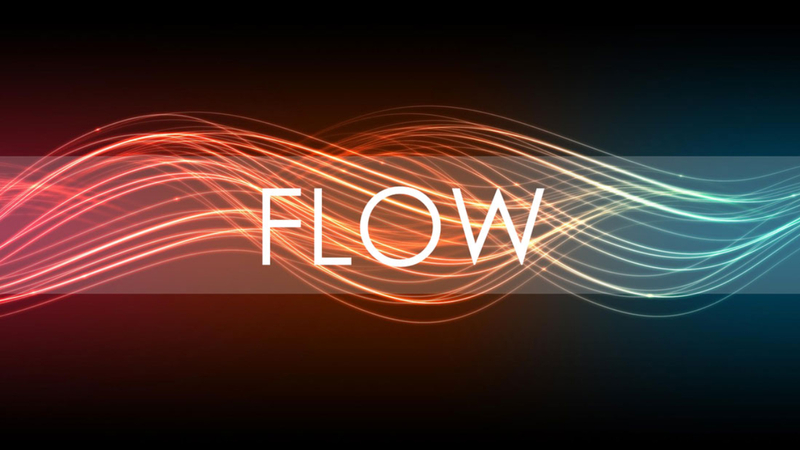 These 6 characteristics are not the cause of flow, but the by-product of it. So how do we experience more this innate flow? By understanding how the human mind really works, and how we create our own experience of life from the inside out. When we understand this big picture, our way of perceiving life shifts, and we naturally find ourselves more in this clarity state of mind. As our relationship changes to the thinking going in our head, our experience in situations eases up as well, and we fall out of our own personal thinking faster, and more frequently. That’s what I see with people I work with through coaching, that the more insightfully they understand how we create our own experience, and how the Human operating system really works, they naturally find themselves more in a state of flow. I don’t like how-to’s as it just gets us up more in our head, and generates more personal thinking. But it’s much better to focus on the big picture, the principles behind it, and then the how-to takes care of itself. Something that is not easy to grasp for our intellect. There is something even more profound about this. When we are less caught up in our head, and more in our natural flow state, we move with life more effortlessly. There is a flow of life’s unfolding and we can be in alignment with that. Which happens when we don’t try to manage our life totally relying on our intellect, which is a life of control. “Imagine that you are riding on a giant barge floating gently down a beautiful river. In the very center of the barge is a giant roller coaster, and your seat for the journey is in the front car. As the river carries the barge downstream, the roller coaster goes up and down, pausing every now and again before climbing its way to the next peak or plunging its way down into a valley. At times it spins wildly, completely disorienting you; at other times, you find yourself resting in the pause between rides. Now imagine that your whole life you have ridden with your eyes closed, believing that the roller coaster is the world and the river only a myth. What would happen the first time you opened your eyes and kept them open for every moment of the ride? At first, you might be a bit disoriented and even frightened as you watched yourself and others going up and down and around and around at occasionally dizzying speeds. The first time you crested the heights of the coaster and saw the river in all its glory, you would be so taken by the view that you would never want it to end. And when your revelation was followed by a plunge to the bottom, it would seem that all was lost. But over time, you would begin to relax into the ride, spending less and less time trying to manage the ups and downs and more and more time enjoying the views along the way. What I have seen in life is when we get out of our own ways life becomes much more effortless and it works out better and more effortlessly than any plans we try to come up with and apply through force of will and determination. I point to the same truth in basically all my articles, so keep following the blog, and let me know if you have any questions, or insights to share. Where do you think your feelings come from?